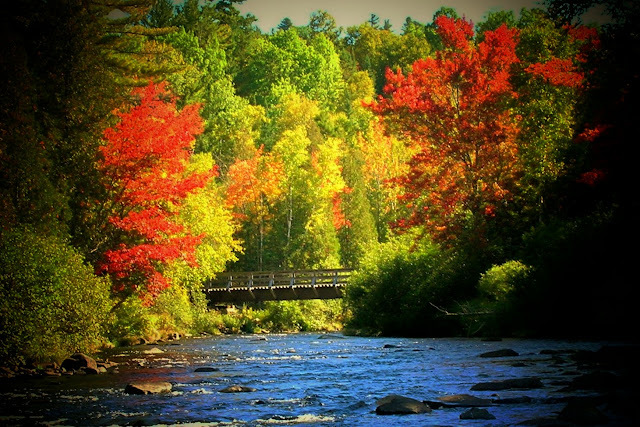 Jeanette and I will be spending a week in the north woods. This will be home and the photos below will be some of the destinations where I'll toss a fly. I hope the brook trout will be in there autumn dress, and the salmon will cooperate. So this will be my last post until we get back. I am not very good at identifying wild flowers, but do enjoy them so very much. It seems as though I see a different type every time I visit a stream. I guess it doesn't matter what they are just that they are there. "Mossy Pool" is located on a wild brook trout stream I frequent. Having fished it many times over the years and in every season of the year I have learned much. It's a deep pool with a nice steady flow and undercut banks. The banks on both sides are lined with a beautiful green moss. A carpet of felt. The head of the pool has a faster flow with two good sized rocks on either side. It then flows into a slower pace to its end. Wild brook trout can be taken at various points throughout the pool. At times it's almost easy to bring one in and at other times it's an impossible task. On this day brook trout could be seen rising. I believe they were taking ants or a caddis emerger for there were a few caddis in the air. I had no ant patterns so on went a EH caddis. The fly went through the pool several times and brought one small response. The brookies kept rising so my assessment of what they were feeding on was right...ants. Looking in my fly box I saw a hopper. It was tied on and pressed into service. As the hopper cleared the large rocks at the head of the pool a brookie rose and took the hopper. He was the first of several to come from "Mossy Pool" this day. There is someone watching the goings on at the head of "Mossy Pool"
I have been tying streamers for about ten years. The first were complete awful wrecks I must say. But fortunately there were a few very talented streamer tyers out there who were gracious enough to comment very constructively and help guide me to become much better. While you look upon a streamer that has come from your making and can find beauty and accomplishment in its design, but to have wonderful comments placed upon it by your fellow fly tyers is the ultimate tribute. 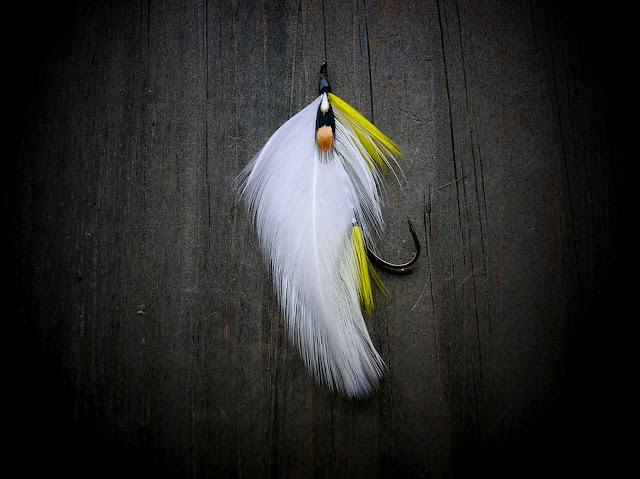 I have been fortunate enough to have a streamer of mine published along side the works of several fine streamer tyers who hail from all over the world. In the latest issue of "FLY FUSION" magazine is the article. It was placed by Darren MacEachern. 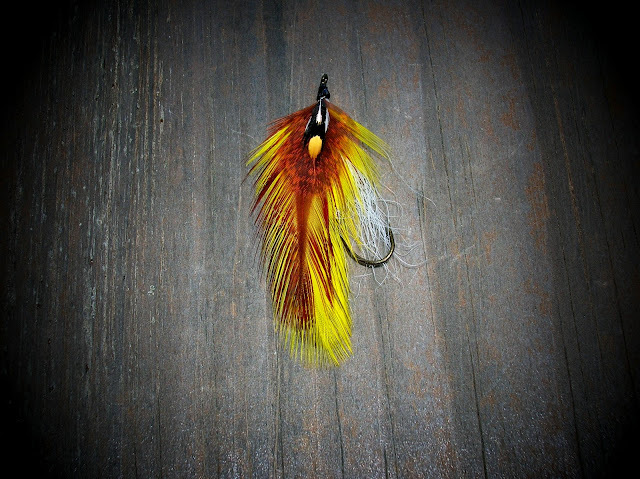 "Adirondack".....a streamer I created a so named for this beautiful region of New York state. I also have a feature on my streamers to be published on, Global Fly Fisher, on September 20th....http://globalflyfisher.com/ Thanks to Bob Petti for the presentation. I hope you'll check this feature out. Time In "Brook Trout Forest"
"A richer, fuller life" the words of Kathy Scott from her book "Brook Trout Forest". This is what I believe she means. I spent several hours yesterday in "brook trout forest". A quiet, peaceful woodland. Myself, nature and wild brook trout. A " richer, fuller life". To sit on a stone by such a place and eat an apple. A "richer, fuller life". I hope all of you can enjoy such a life. A "richer, fuller life". The chance to hold one of natures wild jewels. 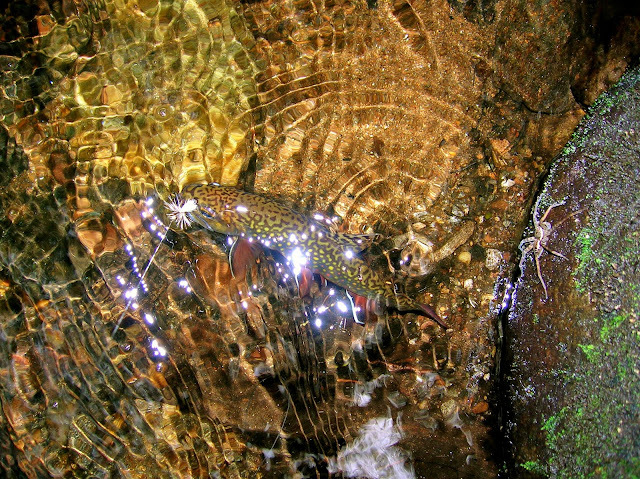 There are many small streams in Connecticut that hold wild brook trout. This one is a special one, I shouldn't say that because all of them are. What I should say is that its surroundings are special. 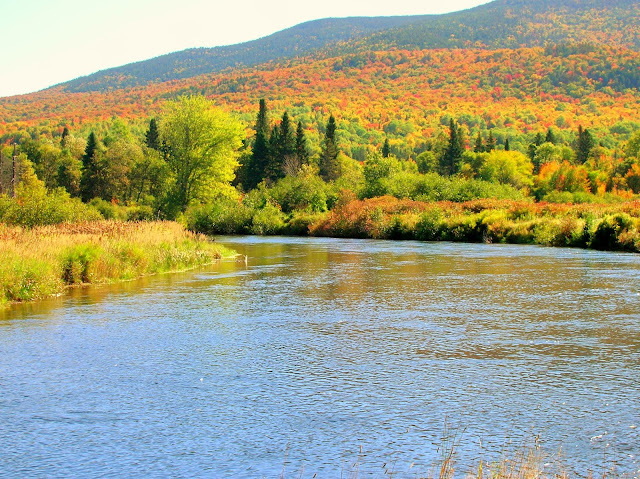 Its located in northwest Connecticut and its a freestone stream. I don't know its origin but can give a guess, some spring fed swamp, with help along the way. The true beauty of this stream is the hemlock forest it flows through. The smell of a hemlock forest is hard to describe, it can be so sweet with that evergreeen fragrance, and also have that boggy, peat odor almost like an old ash tray. The stream was flowing nicely over stones, logs and various other obstacles. A check of the water temp gave a reading of 58 degrees. I tied on a Bomber and started prospecting. The fly was hit repeatedly but by small fish who could not be hooked. After thinking a bit I changed to a wet fly, a Picket Pin, and sent it through a pool. The fly was met with the same result of hits from small fish. I continued to fish under a canopy of large hemlocks, which at times made the area as dark as night. I came to a pool, the water flowing over a boulder and several sunken logs. The water color seemed to look like iced tea. That swift run is where I found the bigger brook trout. They were holding in the fast water behind any boulder or tree that gave cover. The tannin waters of this stream, cold and clean. Wild brook trout. Most of the fish taken were this size, but I'm confident there are a few larger. Again I am so appreciative of such places, and of the special rewards they give. Yesterday morning we arrived at a stream that is rumored to hold a few wild brook trout. Saturdays rains were finished and from the looks of the small stream the rain was of little help. A check of the water temp showed it was 62 degrees, and it stayed much the same as we moved upstream. The air was cool and the forest damp, the smells of nature are many everything from decaying matter to the fragrant pine and hemlock. So many colors along the stream. No cultivation here, only wild. An elk hair caddis was given the first assignment and compleated it. There are lots of places to escape to. And they also provide an excellent place to ambush a meal. I came upon a long glassy pool. It was jammed up at one end from a log and some debris. 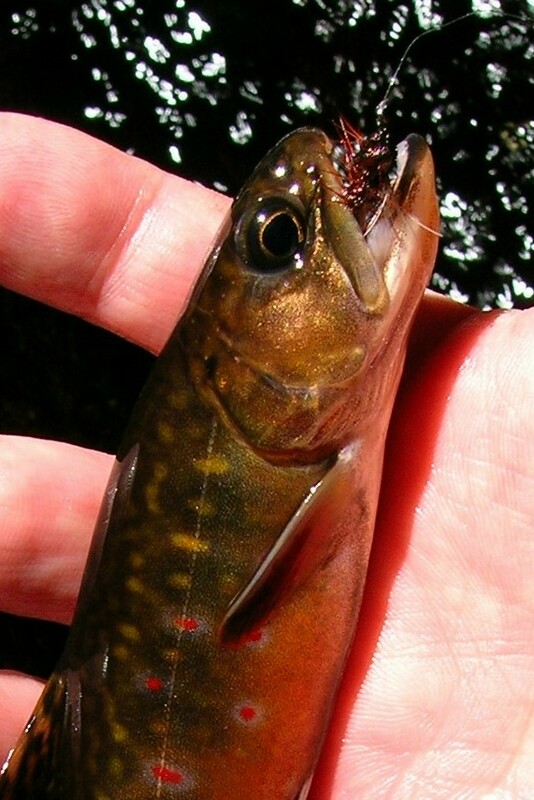 I had put on a hopper and was about to let it drift when a brook trout was startled from the movement of the fly. The trout shot upstream and was gone for the day so I thought. 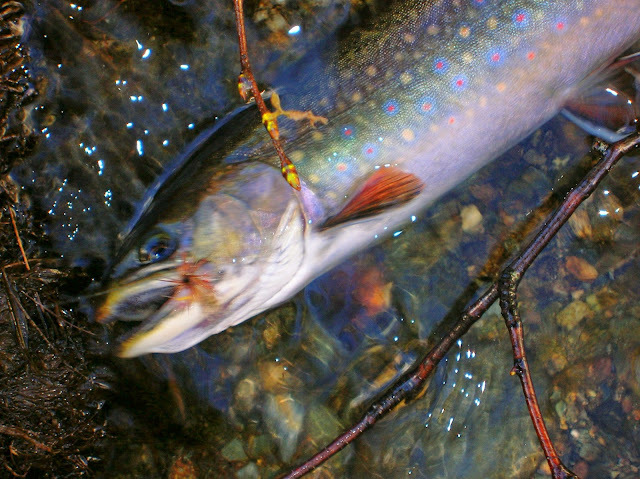 No sooner than the time I finished my thought this brook trout races back down stream past me and nails the hopper. As I held and admired the wild beauty for a few moments I wondered how a fish like this could make it in such cramped waters. As I placed the hopper in the hook holder I said I don't know how he managed to survive, I was so very happy he did. In the small village of Oquossoc, Maine, on the shores of Mooselookmeguntic lake sits a house. This is where the originator of the "Black Ghost" streamer lived. 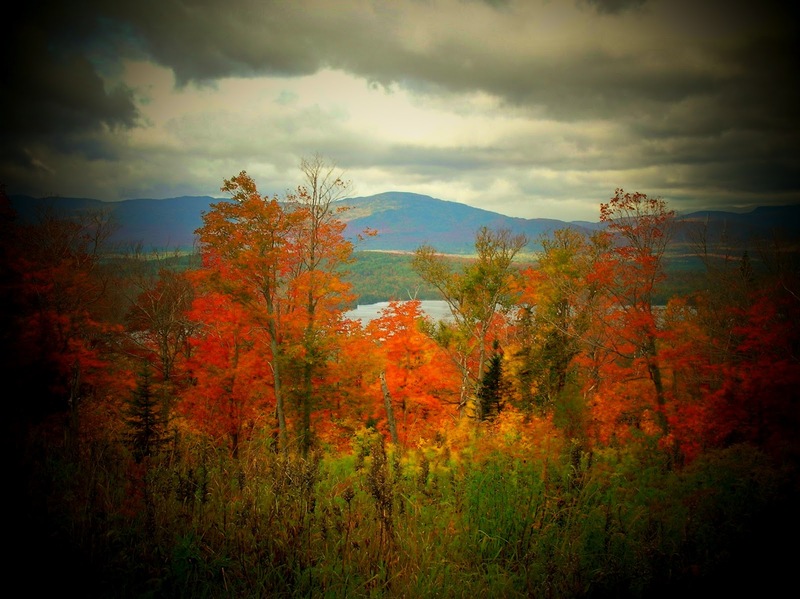 Herbert Welch, was an avid outdoorsman, fly fisher, fly tyer and Maine Guide. In his shop he also did some fine art in the form of taxidermy. The Black Ghost was first tied under his direction in 1927 at the Boston Sportsmen's Show. The streamer is one of Maine's list of fine streamers to gain international recognition. The fly has also proven to be a good Atlantic salmon fly. The Black Ghost is tied in various ways. The traditional featherwing, also the marabou, and a bucktail version. The "Black Ghost". 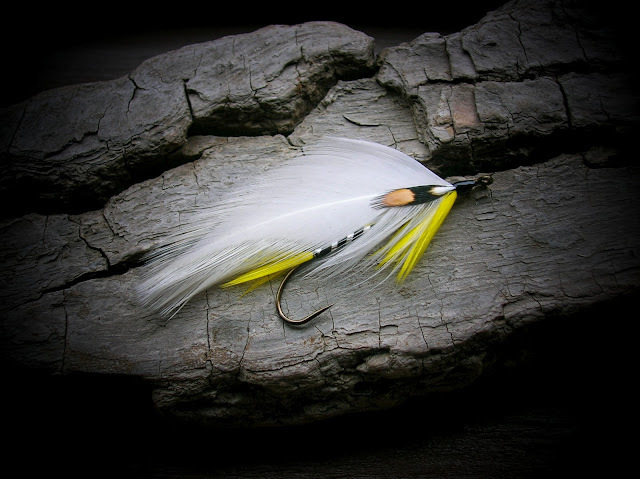 I tied this traditional featherwing true to pattern as written in the book many consider to be the most accurate when it comes to streamer patterns. "Streamer Fly Tying and Fishing", by Joseph Bates. The last few day here have been pretty nasty, weather wise. A few showers and just awful humid air. With so many warm nights it's best to leave the little waters be til a cooler time. The pond in the photo is a place I've fished before. it's located in northern Connecticut. The state puts in a small stocking of trout once a year, and it has a variety of small bass, pickerel, and pan fish. Many years ago while pursuing 'patridge" along the back of the pond I noticed a small brook leading in. And low and behold a few brookies. Well that's for another post. 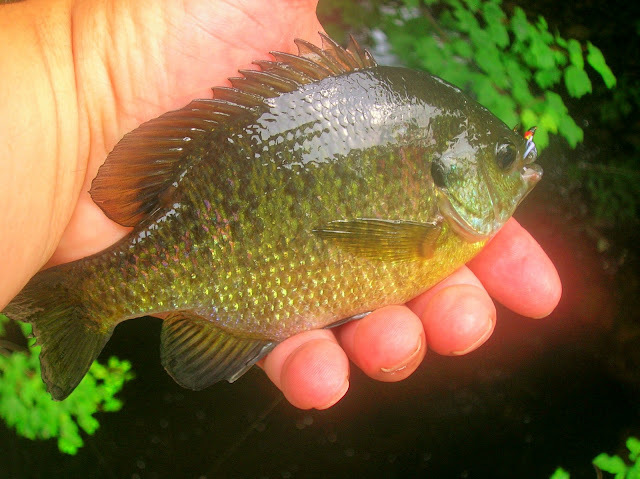 This is about bluegills. Several of you have posted your seeking them, and so do I. A 7ft 3wt is the tool and while most use other types of flies I use a streamer. A colorful one, for who knows there may be a brookie close. A powerful quarry on the right gear. This boulder was probably placed right here by a glacier 10,000 years ago. It has seen storms galore and kept its balance. When I saw it I was glad no one sneezed. 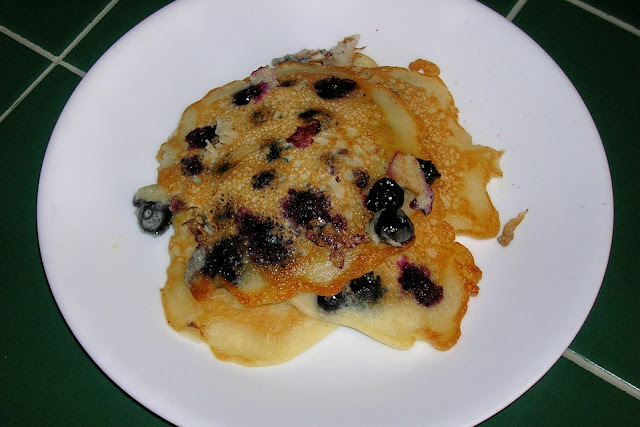 What's better...blueberry pancakes, and pure maple syrup. Structure. You hear of the importance of this from anglers all over, weather it be large waters such as lakes, big rivers, and even in the salt. I believe there is no where else where structure is more valuable than in a small stream. Structure in a small stream can be logs, large boulders, woody debris, leaf jams, and foam. But the best structure is an undercut bank. When you find such a place you can bet there will be a trout in or near waiting to ambush a meal. And if your lucky to find an undercut with some woody debris, or a tree or log associated with it well that heaven. Both these places produced brook trout. This guy snapped up an offering that was close by. Another brook trout from an undercut. With a different color meal. The flies are a variation of worms from the vise of The "Midgeman" He did several post on various aquatic worms. Look them up at his blog. Midgeman Manifesto. September, what a fine month. In its beginning we can tell of the wonderful changes about to take place. The night's are taking on a cooler refreshing feel, that feel translates into a good feeling when I wake. That first cup of Nantucket black coffee is so much better when you have to reach for a flannel shirt to aid in some comfort. There are a host of wonderful smells as we go through September. Orchards are in the process of apple harvest. Pies are baking, and that sweet taste of apple cider. The woodlands along the small streams start to show their change, at first it is subtle but as the month progresses it becomes more pronounced. The colors on the leaves of swamp maples can be brilliant. 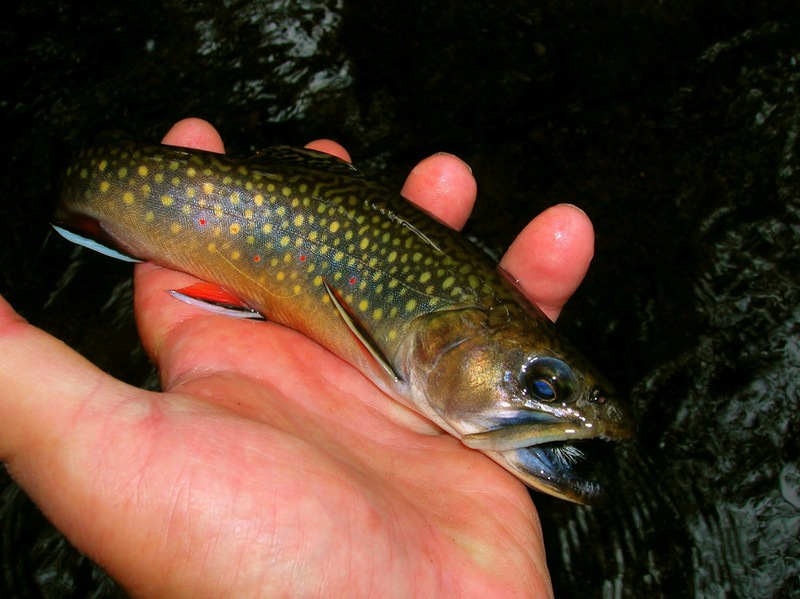 The wild brook trout is now starting to feel a natural change also. It's time to feed as much as one can, and a time to seek mates and to ready the areas where they will reproduce. These are a few streams I have checked this week and they are in good shape. 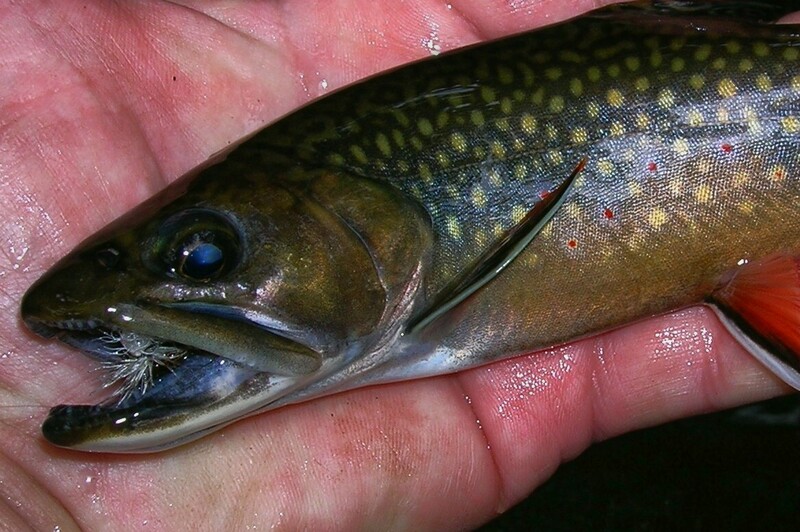 When nature turns the ignition switch, the brook trout will oblige. This month will be a refreshing change from the summer of past. And I for one am looking forward to it.